Cenetta works with the Cathedral Arts Project as both their development coordinator and teaching artist. In her primary role, she’s responsible for ensuring that the fundraising process runs smoothly and achieves all outlined goals. As teaching artist, she’s responsible for instructing, choreographing and creating lesson plans for roughly 40 dance students. Cenetta is also the founder of Emerge Dance, Inc., where uses her skills to empower girls through dance. Her various roles often keep her on her toes, but her determination and passion make all the hustle and bustle worthwhile. Solange Knowles. Her artistry is so inspiring and, while I have never seen her in person, she does things so intentionally. I have loved her ever since “Sol-Angel and the Hadley St. Dreams” debuted, and “A Seat at the Table” has been a huge source of inspiration. She is this walking, talking cloud of creative energy. In addition, I think it takes a strong person to carve their own path in such a distinct way, and she truly has. I think it is extraordinarily brave to live in the truth of who you are and take up space. She does it exquisitely. “Money” by Cardi B or “Juice” by Lizzo, depending on how benevolent I feel that day. “Money,” by Cardi B, or “Juice,” by Lizzo, depending on how benevolent I feel that day. Tap. It’s so fun! I love the challenge of deciphering whether a sound is coming from a toe versus a ball versus a shuffle versus a flap. When I’m in ballet or modern, I’m constantly thinking, “Pull in, push down, elongate.” In tap, I get to be much looser. I can do things with my own defined style and create different rhythms. Teaching it is much more high energy. My primary role is as development coordinator for Cathedral Arts Project, where I am basically the person behind the people who are responsible for fundraising. That’s really the best way I can describe it, as I interact with all the departments pretty frequently. I manage our donor database, run the acknowledgment letters and help keep track of our grants. As a teaching artist, I instruct, choreograph and lesson plan for about 40 students. I plan their costumes, make their hairpieces and hyperventilate along with them on the day of their showcase. For Emerge, I am it. I choreograph, fundraise, manage the website—if they need it, I find it, or work with the staff at Carver Community Center to get it. It depends on the day. I get into the office pretty early, usually around 6:30 or 7 a.m. On dance days, I leave in the early afternoon and head to the school, set up my dance space, teach and then (on some days) head to teach my Emerge girls down at the beaches. When I am at my peak season, I work 13 or 14 hour days a couple times a week. It shoots by very quickly; I hardly even notice until I finally collapse into bed. Yes! Dance has been my passion since I was 3 or 4 years old. I’m not sure where it came from, but I’ve always known it was there. I started at church when I was little. I kept dancing in the aisle during praise and worship, and no one could make me sit down. They finally gave up and threw me in a leotard. (Not much has changed.) My mother finally signed me up for ballet at a studio called Conservatory of Dance. We moved, and I ended up at another studio called Upstage. Then I minored in dance at Valdosta State, and the rest is history. What inspired Emerge Dance, Inc.? 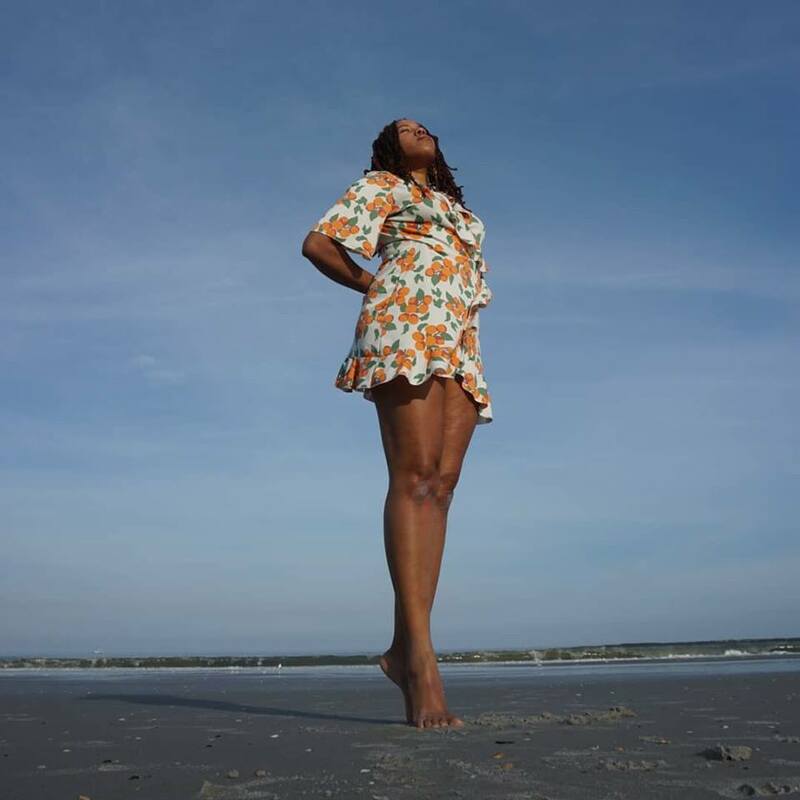 I had just moved to Jacksonville, was in graduate school, and decided to try teaching dance full-time. I have always been a service-oriented person; I like for my work to serve a higher purpose in the lives of others. A community center in Jax Beach was looking for a dance teacher, and the girls needed shoes and costumes, so I decided to log on Twitter and crowdfund the money to get them the things they needed. Emerge began as a means to an end (to get them their money more quickly), but I want it to grow. I am still trying to see my own vision clearly, but at its roots will be using dance, not just to tell stories or deliver a message, but to grow people. Dance begets more dance. It catches like fire. When I see it, I have to join in. Music has a similar effect. Sometimes I will be in our donor database listening to something and I can practically see the dancers in front of me. I have a notebook on my desk in which I scribble everything I see. Other times, it comes in my dreams. My students’ showcase piece came to me that way; I saw it all in one night in April. It took me months to get it all out, but it always comes. My past experiences have been two sides of the same coin. My work in Georgia taught me to work under pressure, but dance has always allowed a profound release whenever I needed it. I’ve also learned how to pivot; when I’m doing one thing, there are times when someone needs something more urgently. School and my past jobs have taught me to adjust quickly and prioritize. My past professional experiences (and school alike) were not the best at teaching me the delicate balance between work and life. My first year at CAP, I ended up putting “learn how to balance work and life” on an individual development plan. I had become accustomed to always being on; when someone sends you an email, you respond immediately. Take your laptop with you when you leave town, just in case you can get some work done. It is not in CAP’s culture to be that way. That isn’t healthy for me, especially as a creative. I need time to rest, or I have nothing to give my art, my students or my coworkers. Being promoted to development coordinator. I started at CAP as a teaching artist, became an intern and was then hired to be executive assistant to development and finance. There were so many things I had to learn while continuing to teach my dancers. There were times I didn’t sleep because I had a million things on my mind, and several more in which I wondered why I had done this to myself. Getting promoted with less than a year maintaining that balance was confirmation I was finding my way. It felt good. Because I am a black woman, gender and ethnicity are inseparable. It’s definitely played a hand in the stories I tell in my choreography, as well as the organizations I’ve chosen to work for. When I attend industry events, I don’t see many faces that look like mine, and I would love to see more. I think the most important thing [for other women] to remember is to listen and check your privilege. Hire black women. Listen to us, and when we express our ideas or points of view, value them. We experience the world differently and our lived experiences give us valuable input. That being said: We are not a monolith, so never assume one speaks for us all. As far as dance, I think the world in general should learn that creation is work. It takes energy to create a piece, to paint a picture or to write a song. Being a creative is a job, so it’s important to pay people for what they create. If you support an artist, be willing to pay them for their time, no matter the art. Nonprofit is full of women and so is dance. I feel like I have been fortunate to have experienced working for organizations that are full of talented women. I have been seeing more grassroots organizations started in order to address a number of social issues, and I’m excited about that. I think everything will continue to evolve as the political landscapes change to fill in gaps and evoke change. So many of the organizations I have seen recently, dance or otherwise, have had women at higher levels. I think it is great. We need more! I have gotten so much better at actually having a work-life balance. I think that is mostly due to the culture at CAP, and my spiritual work as well. I meditate and take time to be quiet before I come into work; I give myself space to feel my feelings so they don’t take over. I spend time outside when the weather permits, particularly during the summer when I can go swimming in the ocean. It calms me, and I feel free to do whatever I need to bring myself back to center while I am in the water. Sometimes I go and have a cry, pray or hop on my body board and let myself play. It’s important for me to have balance in all facets of my life. Go outside. Seriously. I know that seems small, but vitamin D works wonders for the rough periods we all know will happen. Take a break, stand in the sun and do some deep breathing. Do it as often as you can. When I am at work, I call it “taking a lap.” There are times I feel overwhelmed. I choose to be honest with my coworkers and say, “I need to take a lap,” go outside, take a walk around the block and then come back ready to work.